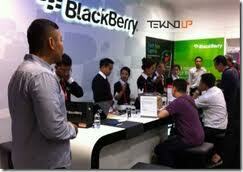 BlackBerry manufacturer Research In Motion (RIM) plans to open 4,000 outlets across the archipelago to strengthen its market in Indonesia, a RIM executive said. “We plan to establish 4,000 points of sale, for customers throughout Indonesia to try and to buy BlackBerry products and services,” RIM senior public relations manager for Southeast Asia Oliver Pilgerstorfer told The Jakarta Post in a statement on Monday. The 4,000 outlets is the target for RIM during the new financial year which started last week and will finish at the end of Feb 2013, he said. He refused to comment on investment spent to open the outlets, but he said the initiative was in line with the BlackBerry retail stores program where RIM opened dedicated BlackBerry stores with their key partners for customers to get the full BlackBerry experience.